1. I made some slippers! Felted Clogs to be precise. I love this pattern and I’ve already committed myself to making two more pairs. One pair for the Mister and I think my sis might like a pair too. 2. I’ve been working on NaNoWriMo, but was unable to write yesterday because of some random family drama and didn’t write again today because of my arm is feeling all hurty again. I need to have a totally doable 6,200 word weekend to catch up, but am seriously considering just dropping out again this year. If my arm is going to be hurty, I think I’d kind of prefer to have some slippers at the end of it, if you know what I mean. 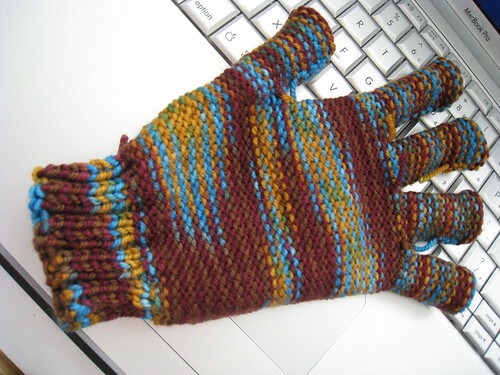 If you had to choose between NaNoWriMo and knitting, which would it be? 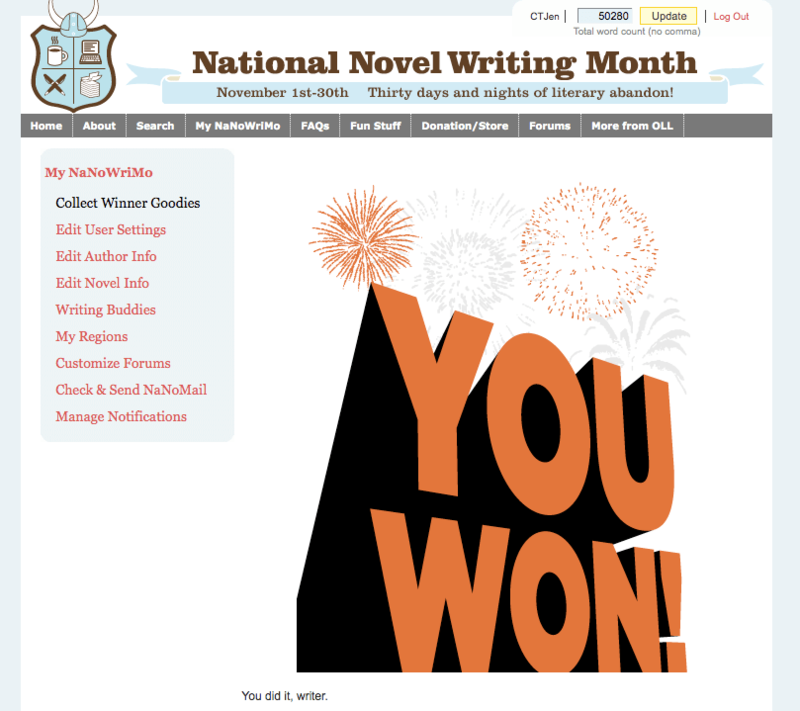 …on NaNoWriMo 2010. My tendonitis flared up again, and by the time it’ll feel better I’ll have to give myself tendonitis just to catch up again. And frankly I’m just not enough in love with my story this year for it to be worth killing my arm. I’d rather be knitting. Anyway, good luck to all the WriMos still plugging along! You can do it! Yesterday was the first of November and you know what that means! NaNoWriMo has begun!! I’ve been diligently plugging away, starting at midnight on Halloween night. I wrote about 700 words before I went to bed, staying up way past my bed time in the process. When I woke up yesterday, I wasn’t really excited about my story idea and as I tried to muster up some motivation to work on it, I realized that I am sorely out of writing practice. My writing muscles are considerably flabby. *wobble wobble* Last year (or was it the year before?) I had at least done some prepwork for NaNoWriMo. Not to mention I had been a more consistent blogger. I managed to hit my qutoa for the day anyway. Yay! I know I’ll get back into the swing of things, but that isn’t to say I didn’t consider throwing in the towel already. But I’ll keep at it anyway. Because it’s worth it. Anyone else out there doing NaNo? Feel free to add me as a buddy! 1. 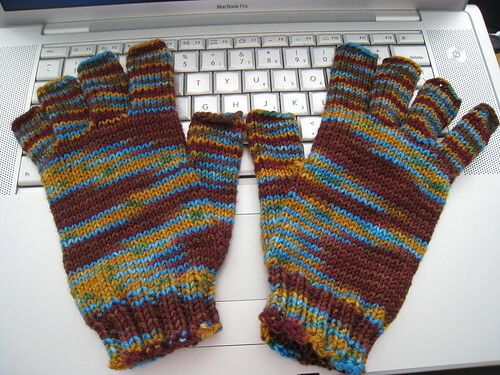 I finished the Knucks, although not in time for Rhinebeck. 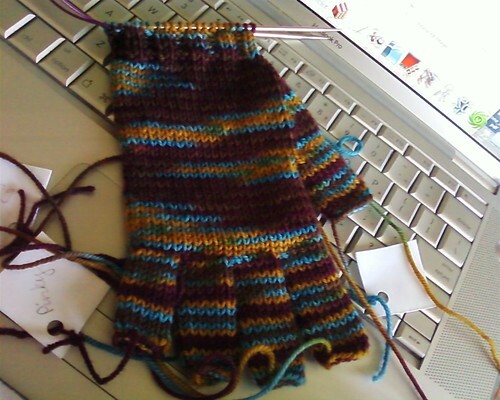 Which was totally okay because it was way too hot for fingerless gloves at Rhinebeck anyway. 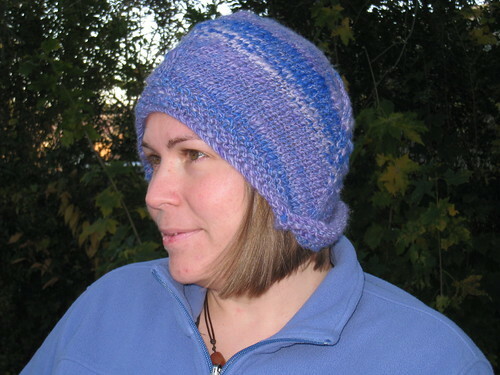 I seriously considered weaving the ends into the knit side so I could wear them with the purl side out. 3. After I finished the Knucks, I cast on for a pair of Felted Clogs. 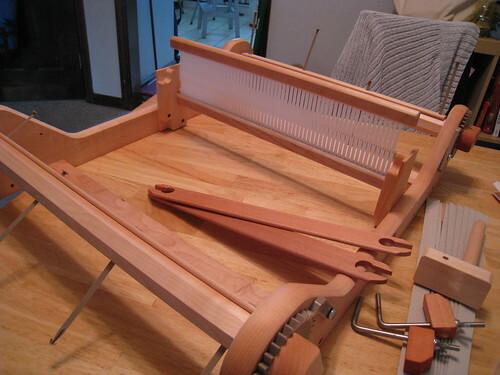 I’ve finished one clog, but seem to have second slipper syndrome and have been spending a lot of time fantasizing about working on something different. 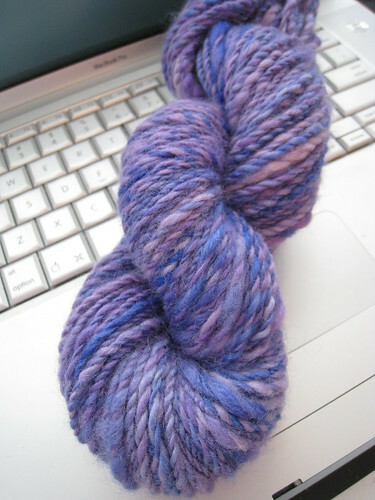 and a little bit of spinning fiber. 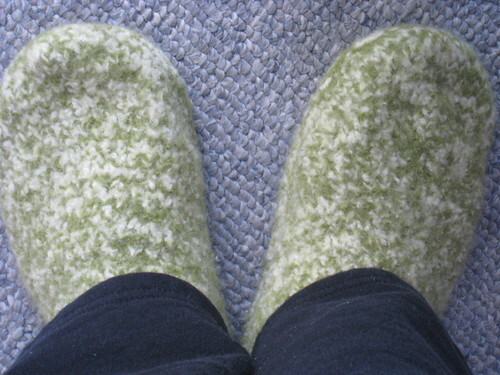 Any wonder I am feeling a little bit of second slipper syndrome? 5. NaNoWriMo is looming (heh heh heh). I have no idea what I’m going to write about. No characters, no plot, no nothing. This should be interesting. 1. I spent Friday night in the ER, thanks to a Starbuck’s barista playing fast and loose with the procedures that keep cow’s milk and soy milk separate. Note to all Starbucks baristas: soy milk and cow’s milk are not interchangeable! And yes, I really can tell the difference. 2. 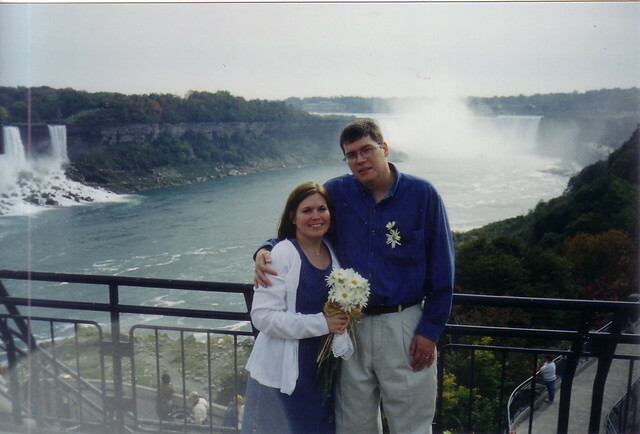 11 years ago yesterday, my husband and I were married in a small private ceremony at Niagara Falls in Ontario, Canada. People, if you haven’t made these yet, don’t let the finishing work put you off! It’s really not that bad. So go. Go now and make some Knucks! 4. Today is 10-10-10. Just sayin’. 5. Last night as I fell asleep, I was trying to come up with an idea for my NaNoWriMo novel this year. I woke up this morning with a great idea involving a bus, temporal displacement, and a sleepy mountain town in Colorado. Now to come up with a large cast of characters.